On February 1st, 2019, I bought an additional 300 shares of Energijos Skirstymo Operatorius (ESO1L) paying EUR 0.736 per share. As this stock is from the Nasdaq Baltic listings, it's hard to forecast future dividend for it, but as I have this stock in my portfolio since 2017, I know that there are bi-annual dividend payments happening in April and October, and the dividend has been in the range EUR 0.03935 (2018) - EUR 0.10386 (2017) during 2016 - 2018. In fact, this is one of the rare Nasdaq Baltic stocks paying dividend twice a year. 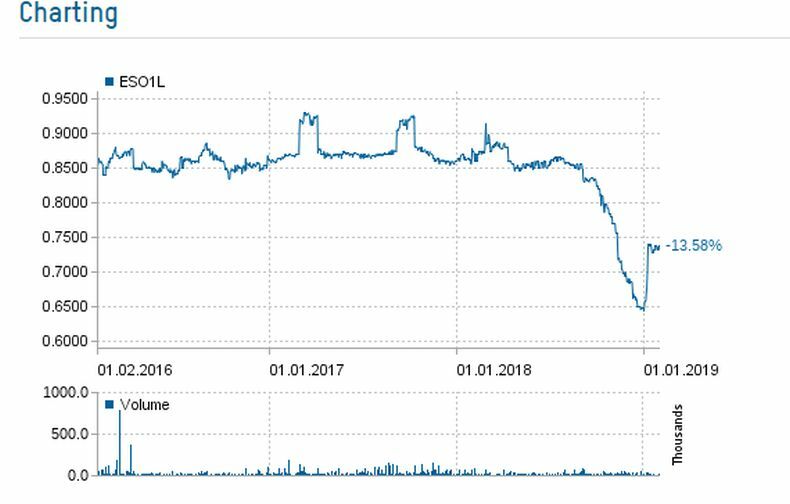 Since being listed on the Nasdaq Baltic (around January 2016) the stocks price has lost about -13.58%, with the largest drop, happening at the end of 2018. I'm pretty bullish on this stock for the long term, bus, as they say, do your due diligence before investing. I have this stock on my portfolio because I like that in the past the stock had bi-annual dividend payments. Energijos Skirstymo Operatorius actually is the largest company on Nasdaq Baltic by the market cap. Energijos Skirstymo Operatorius AB was established January 1, 2016, merging LESTO AB and a joint-stock company Lietuvos dujos. ESO is controlled by a state-owned group of energy companies “Lietuvos Energija”, one of the largest energy companies in the Baltic States. Main activities of ESO: electricity supply and distribution, natural gas distribution, guaranteed supply of electricity and natural gas, an introduction of electricity and gas, maintenance and development of electricity and gas distribution networks, security and reliability of energy distribution assurance.